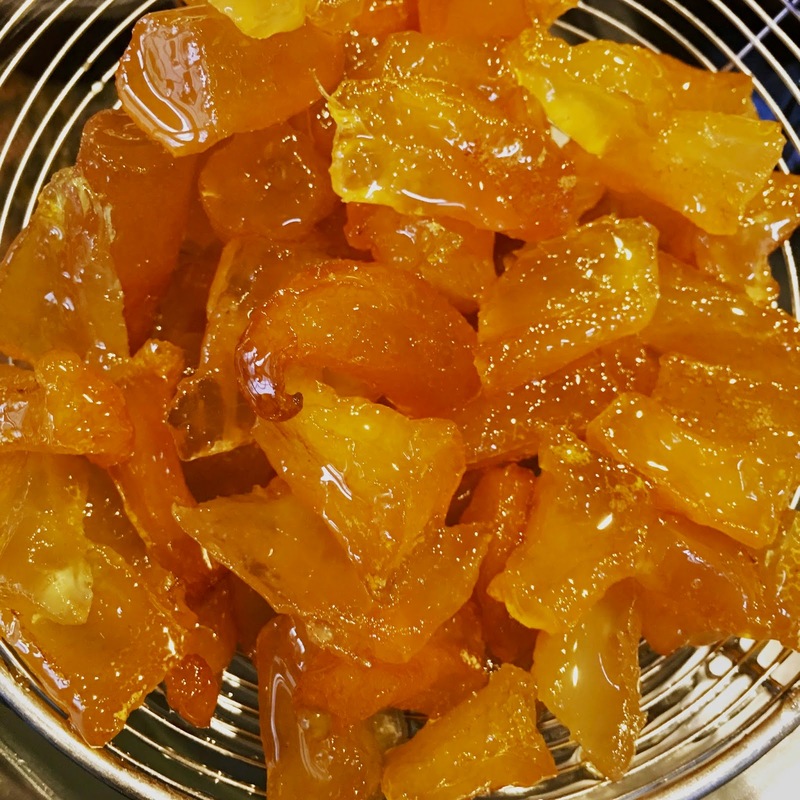 The Lunar New Year in Taiwan was when candied kumquats showed up in every single marketplace. My favorite candy shops were on Dihua Street, an older shopping area that was nothing but Japanese-era brick buildings and baskets filled to the brim with dried and preserved ingredients. It was, in short, heaven. 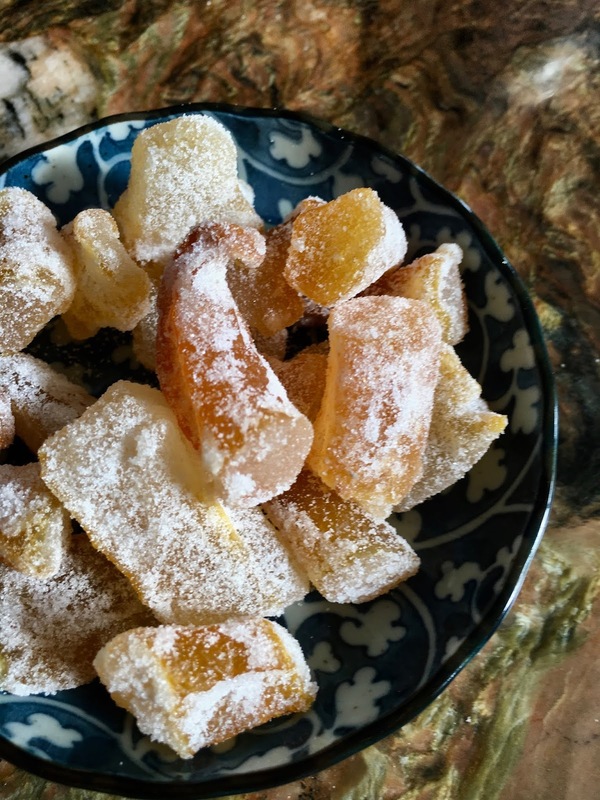 I’ve never been able to resist fresh kumquat candy, but the stuff on these shores often are leftovers from the Jurassic period, which is why I created this recipe years ago to satisfy my craving. We’ve had a Buddha’s hand citron in our yard for years, and this winter it finally decided to give us a bumper crop. So, of course, I made Buddhacello (vodka + sugar + chopped up citron), as that is always at the top of my list whenever I’ve received bounty from my friends. 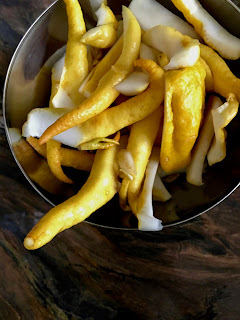 But this year, I decided to make candied Buddha’s hand citron because a) both citron and kumquats are of the same family and b) I didn’t have any kumquats sitting around and c) these citron are so aromatic that I could smell them all the way up on the second floor. These surpassed my expectations. The coating is slightly crunchy against the perfectly jelled centers. They fill your sinuses with the most exotic of perfumes. They’re easy. Plus, you end up with a syrup that tastes like a cross between butterscotch and lemons. 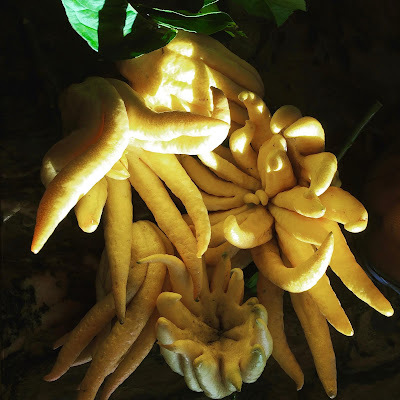 Get yourself some Buddha’s hand citron and see what I mean. 1. 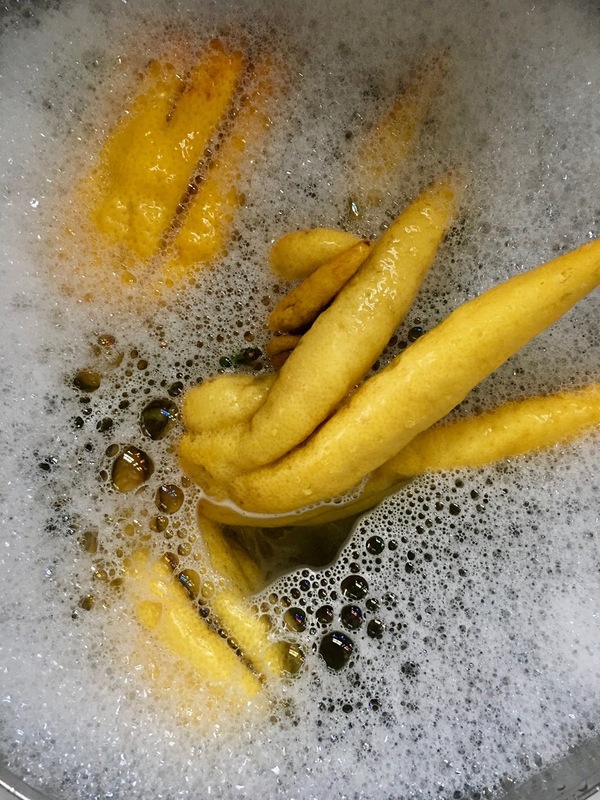 Place the citron in a bowl of warm, soapy water to soak for a few minutes, and then lightly scrub it with a soft brush. Use a paring knife to remove the stem, and then slice it along the base toward the tentacles, so that you end up with longish strips. Be sure and wash out any grime hidden in the folds. Rinse the citron and pat dry. Don’t worry if you have lots of pith, as this candies up beautifully. Cut the strips into 1-inch | 2 cm batons that are more or less the same thickness, about ½ inch | 1 cm. 2. Place the citron in a 2-quart | 2-liter saucepan and cover with water by a couple of inches or centimeters. Bring the pan to a boil and then lower the heat to maintain a steady simmer. Cook the citron for about 45 minutes, topping the pan off with more boiling water as necessary, until the citron is translucent. Drain the citron. 2. In the same pan, bring the 2 cups | 500 ml water, rock or white sugar, corn syrup, and salt to a boil, cover, and then simmer over low heat until the sugar is dissolved. Add the citron to this syrup and bring the pan again to a steady simmer. 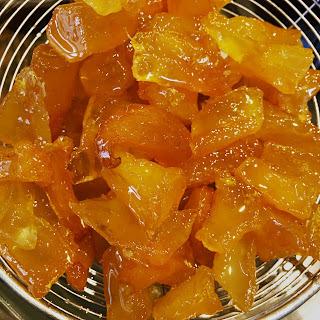 Cook the citron for about 25 to 30 minutes, until the syrup reaches around 230ºF | 110 ºC on a candy thermometer. (Be sure and use this larger pan, as the syrup will froth up about halfway through the cooking time, and you don’t want this to boil over.) The citron will look like lustrous amber at this point. Let it soak in the syrup until this comes to room temperature. 3. Strain out the citron and let it continue to drain, but reserve and refrigerate all of the syrup for something else. It is incredibly delicious, so don’t waste a drop. When the citron is dry, toss it in the ½ cup | 100 g sanding sugar, and then set the citron on a cake rack over a pan to dry overnight. Layer the candied citron with the leftover sanding sugar in an airtight container. 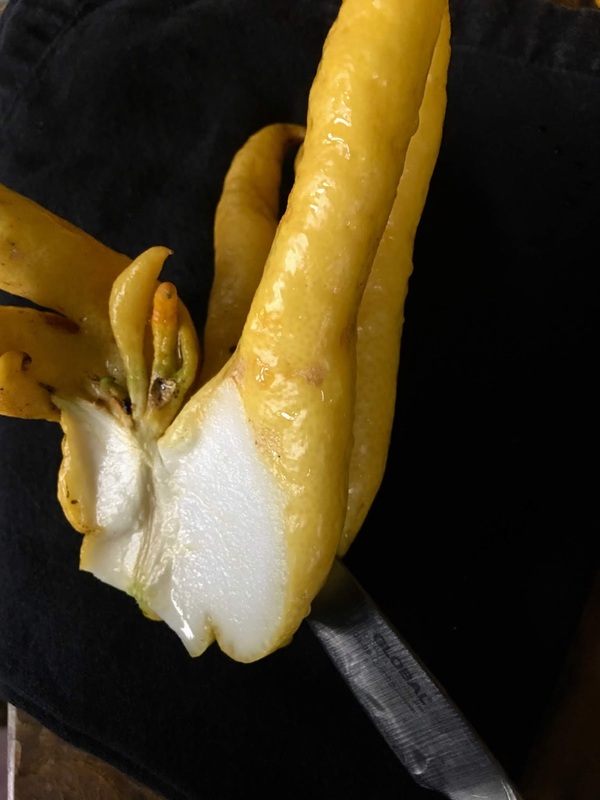 You can use this like any other citron, or serve it as a New Year candy with hot tea. The syrup will most likely crystallize as it cools, so just heat it up before you use it.